Lynch Creek Dahlias: What's in a Dahlia Name? A Lot of Imagination! 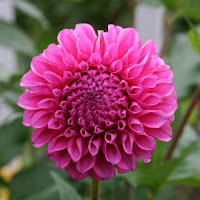 Polyventon Supreme, Hugs 'n Kisses, Danjo Doc, Barbarry Red Baron, Camano Ariel: What's dahlia-like about those names? Not much. The names are almost as weird and widely varied as the names of racehorses. But think about it: The American Dahlia Society currently recognizes more than 2,750 varieties; with hundreds of new varieties entering the scene each year, naming is a challenge. Some hybridizers still attempt to make the names descriptive of some aspect of the variety, like Lavender Ruffles; some individualize them by incorporating a line identifier, hybridizer name or location in the moniker, like David and Leone Smith's Chimacum Katie. 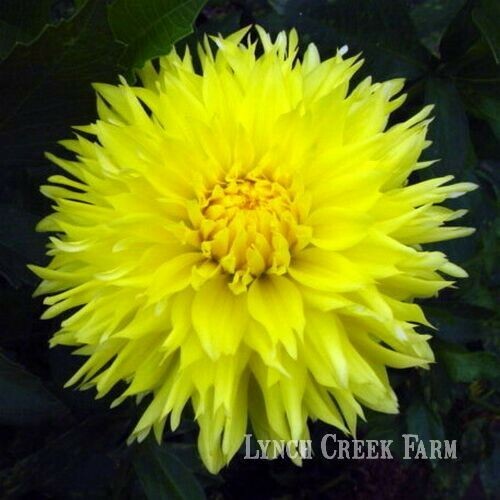 Of the yellow dahlias grown at Lynch Creek Farm, for instance, several have descriptive names. Baby Yellow is a single yellow miniature; Golden Star and Golden Egg give a sense of the color and shape of a slender-petaled orchid type and a rounded waterlily type. Sunflare has distinctive pointy petals in sunshine yellow, and Midnight Sun is rounded and slightly peachy like an Alaska sunset. Yellow Bird is a collarette with feathery petaloids surrounding the center disc. But Honka? Hissy Fitz? A surprising number of food names for dahlias suggest a sense of the color and, sometimes, the shape of the flower: Ginger Snap is a golden, flattish waterlily dahlia; A La Mode and Peaches-N-Cream have creamy-white tips, while Peaches is simply peachy. Lollipop is round and orange and sweet; Citron de Cap is pale lemony in color and big and deep as a small citron melon. Blackberry Ice is the color of blackberry ice cream; it reminds one of the color of the plate when your blackberry pie comes a la mode. Mrs. Black is anything but black. You'll never see a falcon the flamboyant yellow, coral and cerise of Falcon's Future. Or, probably, a banker as pink and pretty-petaled as Barbarry Banker. You might expect Pucker Up to be lipstick-red—but no, it's yellow. Lemon yellow. Puckery lemon yellow. 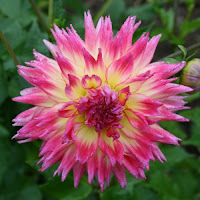 Oh, those crazy names of dahlias. What's your favorite?